To the distant north and west, the Norsemen, Danes, Angles, Goths, Saxons and Jutes kept the solstice as Yuletide. While there is no record of gift-giving or school-closings, these simple, hardy folk brought a special beer to the tradition. The season was a natural; winter was an excellent time to brew and drinkbecause it was the off-season for war. In the year 597, Pope Gregory the Great sent Augustine the Monk to convert England's Angles into angels. Because sacred feasting was popular among these worshipers of Odin, Gregory advised his emissary to co-opt pagan traditions rather than suppress them. In particular, Yuletide feastings were to be rehallowed as "Christ Mass," and Yule beers became, overnight, Christmas beers. The author of a 1908 history, Beverages, Past and Present, found the tradition intact: "Homebrewing of ol, a native ale, has always been a practice in Scandinavia... Usually ol is an indifferent beverage, but at times one will meet with some in his or her travels that is really excellent. 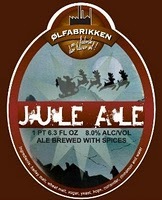 This is more apt to occur around the holidays, for at that time jule ol, or Christmas ale, is made and this, it is deemed, should be stronger and better than the ordinary beverage." In the Saxon villages of England, ale was the official drink of church holidays. Strong ale was reserved for holidays because people didn't have to work and thus could devote themselves to drinking and its consequences. Rounding out the tradition, ales brewed during colder weather were brewed to a higher alcohol content to serve as "winter warmers." In the U.S., San Francisco's Anchor Brewing Co. revived the holiday beer tradition on the microbrewery level. "Our Special Ale" was first offered in 1975 and each year's brew is unique, often aggressively so. Owner Fritz Maytag makes a point of brewing his ale to appeal to a minority taste. (This year it's darker than motor oil and seems to have more than a touch of cardamom.) Each year's bottle label is an event as well, featuring a different tree to honor the Yule tradition. The idea rose to a regional level in 1983, when Utica's F. X. Matt Brewing Company introduced its "Season's Best" beer. 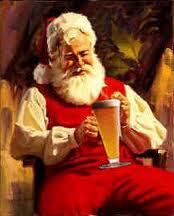 The first national brewer to make a winter beer available was the Adolph Coors Company of Golden, Colorado. In 1986, they expanded a family and employee tradition to include their home state, sharing one run of "Winterfest" lager with the public. The response was enthusiastic, and the following year they began offering Winterfest everywhere Coors was sold. In every case, the brewers set out to give their patrons "more," usually more malt, more roasted malt, more hops, for a darker, heartier, more flavorful brew. Many brewers and brewpubs add spices such as clove, cinnamon, nutmeg and ginger in keeping with the flavors of the season. "Wassail" comes from the Middle English expression "Waes Hail," or "be thou well," a common toast made when drinking from the Wassail cup or bowl. 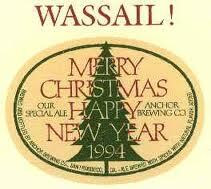 Wassail itself was a beverage made with ale or wine flavored with spices, sugar, toast, roasted apples, and also known as "Lamb's wool" for its warming properties. Often after drinking Wassail, one became a Wassailer and went Wassailing, that is, singing Christmas carols from house to house, and you were perhaps even invited in to drink more Wassail, and thus be put in danger of becoming Wassailous. This article was written for Zymurgy in 1987, rewritten for the Syracuse New Times in 1996, and edited again in 2003.